All of the flavors of your favorite soup are wrapped up in puff pastry for this delicious appetizer. It is a perfect make ahead snack for your next party. There is just something about a good french onion soup. The deep, slightly sweet flavor of slowly caramelized onions, a bit of crunch from the crusty bread and the gooey melted cheese topping just come together in a perfect bite. The problem is it is hard to eat it gracefully and even harder to eat it on the move while mingling at a party. So, why not take those flavors and turn it into a palmier? That's right! Just imagine it, slightly herbed caramelized onions, melty Gruyere all wrapped in a crispy buttery puff pastry crust! I love hosting parties and my favorite kinds of parties are those that are full of finger foods and small bites. They are the best because you can have a taste of this and a taste of that. That way there is a little something for everyone and so much to enjoy for people like me who just want to try it all! Whether it is a holiday, a shower or an awards show party, sometimes it is fun to take those appetizers and dress them up a bit. 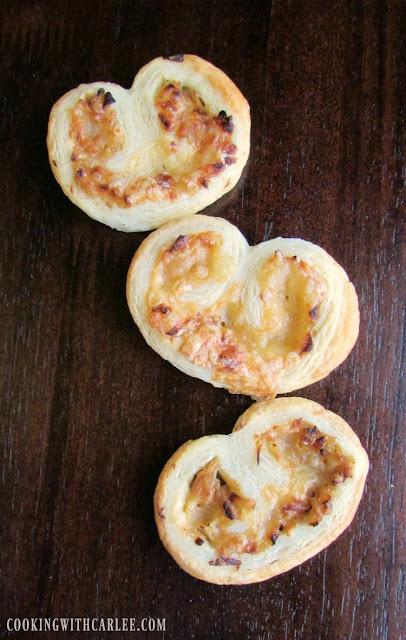 These french onion palmiers are a perfect addition to any party and are happy to find their place among these fancy appetizers. Fancy soiree or casual get together, if I'm making a whole menu I like to have some food that can be prepped ahead. That way I can enjoy my guests when party time comes. The palmiers meet those requirements as well! Properly caramelizing the onions does admittedly take a while, but it is mostly hands off and it can be done a day or two ahead. In fact, you can do them in the slow cooker if you'd like! Let them cool, great some Gruyere and roll them up in some puff pastry. A trip to the refrigerator to get the puff pastry nice and cold again, a few slices and a trip to the oven. In no time you have a delicious and pretty appetizer. In a skillet over medium-low heat, melt butter. Add onions, bay leaf and pinch of salt and stir to combine. Continue to cook over low heat as onions slowly cook and caramelize. To do it right, it will take a long time but it is low maintenance. Just give it a stir every so often and let them slowly develop an nice golden color. Once they are completely caramelized, stir in the garlic and thyme and remove from the heat. Allow to cool to room temperature. Roll out the puff pastry to about 1/4" thick. Spread onions over puff pastry, leaving a small border on either side. Sprinkle with shredded gruyere. Roll one side toward the center of the dough. Then repeat with the second. Wrap tightly with plastic wrap and refrigerate for at least a half hour. 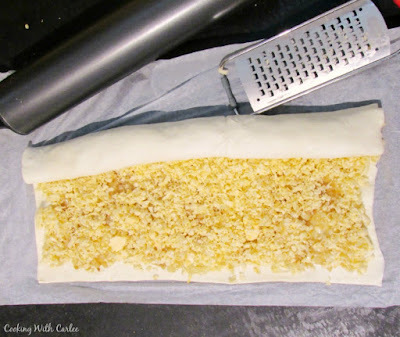 Preheat oven to 400 F and line two baking sheets with parchment paper or silicone mats. Cut stuffed puff pastry dough into 1/3" slices and carefully transfer to baking sheets. Bake for 15-20 minutes or until puffed and golden. Yum - You had me a Gruyere! Picture perfect palmiers!!! Love this flavor! Mmm this looks soooo good!! I love the flavor combo!!! OOO! These look delicious! Love that French onion soup in bread! Great dish to try. Thanks. Thank you so much, Linda! I hope you love them! French onion soup is one of our faves. I can't wait to try these palmiers. They are such a fun way to get all of those flavors! Great tip about making the onions in a slow cooker. These palmiers are fabulous! The slow cooker makes them so much easier and you can do a bunch at once! Thank you so much! 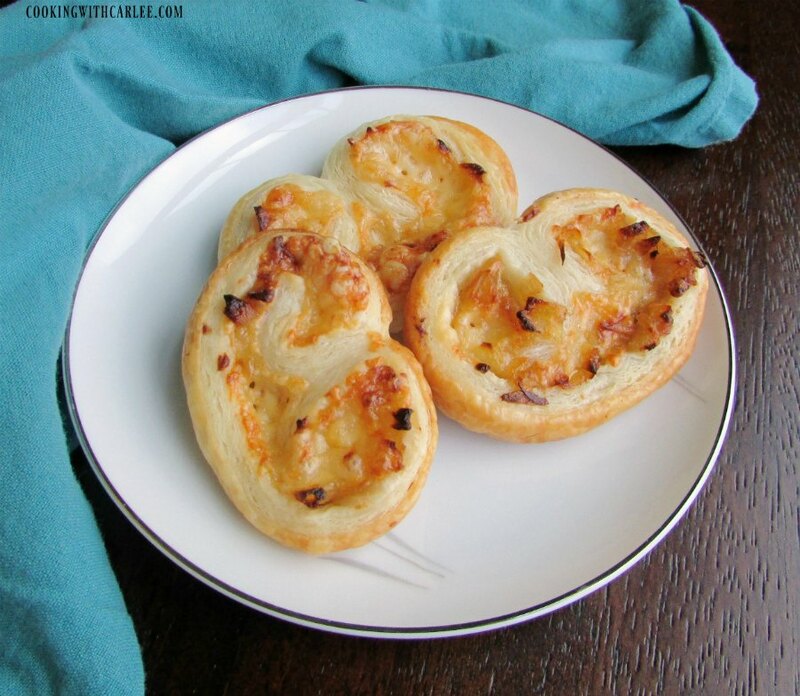 My husband is a connoisseur of french Onion Soup and would love these! I can't wait to surprise him with them! These would be perfect for him! I hope you love them! French onion flavors that you can hold in your hand.....that's what I'm talking about! Oh how I end up with cheese all over my chin, lol. These look amazing!! And sound so tasty!! That dang melty cheese, so good and so dangerous! These are much safer! Thank you! I love palmiers and these flavors sound wonderful! 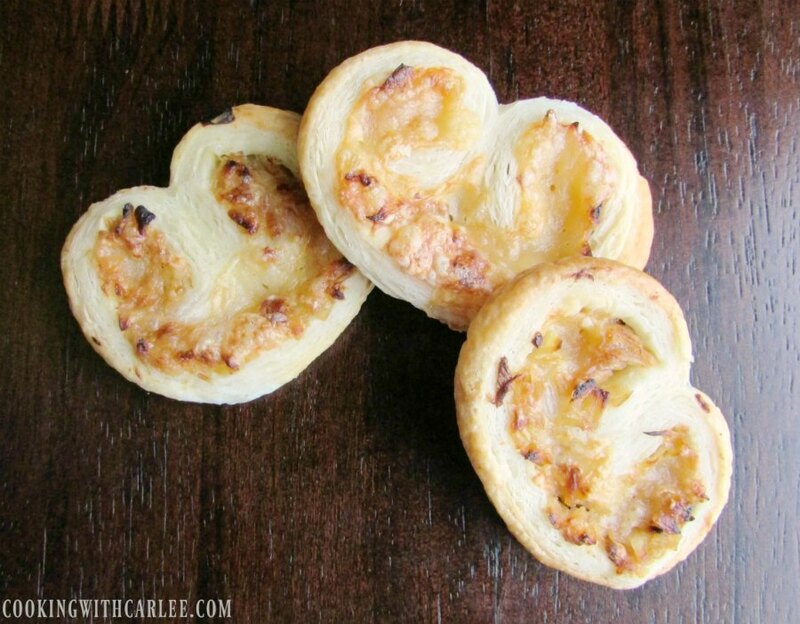 Love your French onion twist on these palmiers, they look delicious! Oh I love how these are little crisps of onion-soup! I need to buy puff pastry and stock up, I think! Oh Carlee, yum!! This is a genius idea and I love it! I might not be able to wait for a party, though!! I want one now!! Don't wait, just go for it! Thanks, Mollie! Thank you! Now that the holiday craziness is over, I hope to join a lot more frequently! Hey Carlee, they look delicious. Thanks for sharing the recipe at C&C with J&J! Mmmmm. These look great! I love French Onion anything! Thanks for sharing with us this week at the Family Joy Blog Link Party. Please join us again next week. These look yummy! Thanks for linking up with What's Cooking Wednesday! Hi Carlee, these would make the perfect finger food or would go down nicely with a nice hot bowl of soup. I had no idea you could caramelize onions in a slow cooker. You know where I'm off to next? They would be perfect with soup too! You should definitely try the onion in the slow cooker! These are so pretty, Carlee! I love them! Thank you, they were definitely fun ones! Carlee, the caterer that I work for makes these for appetizer Buffets. They are great finger foods, and you can pair them with so many different things. Plus the fact they look gorgeous they also have great flavor. I'm not sure that he uses gruyere cheese, I will definitely give him your recipe. Thank you, Nikki! There are so many flavor combinations you could do too, which makes them fun and they can be prepped in advance which is perfect for a party! Thanks so much for sharing these awesome Palmiers with us at Full Plate Thursday! Hope you have a great week and come back to see us real soon!